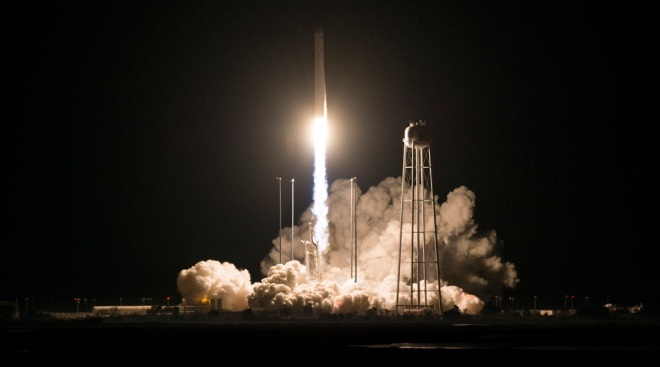 In this file photo, The Northrop Grumman Antares rocket, with Cygnus resupply spacecraft onboard, launches from Pad-0A at NASA's Wallops Flight Facility on November 17, 2018 in Virginia. America's next moon landing will be made by private companies — not NASA. "We're going at high speed," said Thomas Zurbuchen, head of NASA's science mission directorate, which will lead the effort. "These are not expensive missions," Bridenstine told reporters before the announcement in Washington. "This is like a venture capital kind of effort where at the end of the day, the risk is high but the return is also very high for a low investment." He added: "Our goal is to learn as much as we can possibly learn and help this fledgling industry develop here in the United States."